Brown Leather Jewelry Case with Dividers, Slots for Cufflinks and Locking Clasp. Pigskin Lined. 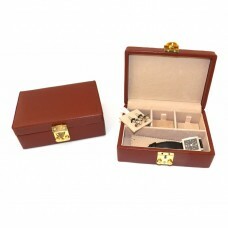 Jewelry case in brown color measures 2 1/2" x 7" x 4 3/4" and is made of leather for durability. Case has dividers, cufflink slots and locking clasp with pigskin lining for protection.